So just how does the team here at Anderson Ford differentiate itself from the rest of the competition? It all starts with cutting the stress out of your shopping experience. Instead of bombarding you with sales pitches and other aggressive tactics the second you walk through our front door, we make it a point to give you a little space and as much time as you need to sort through this important decision. 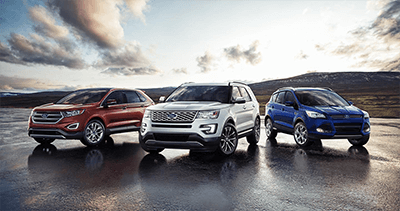 When you are ready to learn a little more about the beautiful new Ford car, truck, or (SUV) that catches your eye, a member of our trained and friendly staff will be there to help guide you through the next steps of this process. Ford continues to raise the bar when it comes to quality and performance in each automotive category. To prove this point, you need to look no further than the latest Ford cars, trucks, and SUVs to roll straight off of the designing room tables in Detroit and onto our showroom floor. The Ford Fusion is here to do one thing: Reimagine the sedan experience and break the mold when it comes to driver expectations. Of course, when you start packing in premium features like the Fusion's optional hybrid powertrain, in-car Wi-Fi, and access to the Ford SYNC smart car system, meeting — and surpassing — this lofty goal simply becomes part of the process for the leading name in American automotive innovation. Being America's favorite truck for nearly four decades is far from an easy task to accomplish. Even so, the Ford F-150 has shown that it is willing to do whatever it takes to hold on to this distinction. In fact, with access to the latest edition of Ford SYNC and MyFord Touch, as well as expanded cabin space and a military-grade aluminum alloy body, it looks as if the F-150 is ready to embark upon another 40-year run of excellence. Looking for an SUV that is ready to handle any adventure that pops up as you make your way around the streets and trails of Clinton Then it is time to give the Ford Escape some attention. With access to a veritable mountain of safety features (like the Blind Spot Warning system) and the Ford SYNC smart car platform, tackling all of the challenges of your daily commute has never been easier. There really is something special about taking to the streets in America's most iconic muscle car. Whether you are drawn in by the 526 horsepower (hp), 5.2-liter (L) V8 engine, the classic tri-bar taillamp configuration, or the Mustang's new tech inclusions, like the performance-gauging Track app system, it is safe to say the mystique found within this muscle car's heritage is alive and well in the latest model to hit our showroom floors. The cars showcased here are naturally just a small sampling of what Ford is producing to make life easier for prospective car buyers in the Clinton area. To truly experience all that this leading automaker can offer you, feel free to give us a call today at (888) 715-6476 and schedule an appointment with one of our trusted Ford experts. You might have noticed by now that the team here at Anderson Ford is absolutely enamored with the latest Ford vehicles to take center stage at our dealership. While there is no point in denying this, the truth of the matter is that we are far from the only ones out there who think Ford has knocked the ball out of the park with its current offerings. To give you an idea of what the rest of the industry has to say about Ford, it makes sense to start by checking in with the National Highway Traffic Safety Administration (NHSTA) and the Insurance Institute for Highway Safety (IIHS). Both of these esteemed organizations have awarded their highest accolades to Ford in regard to safety, performance, and reliability. Additionally, the Ethisphere Institute has also chimed in on this conversation and declared Ford as the most environmentally responsible member of the automotive world — and the only manufacturer worthy of earning a coveted spot on its vaunted "Most Ethical Companies" list. Putting all that you have learned here together makes one point clear in a hurry: Buying a new Ford is a decision you will never come to regret.